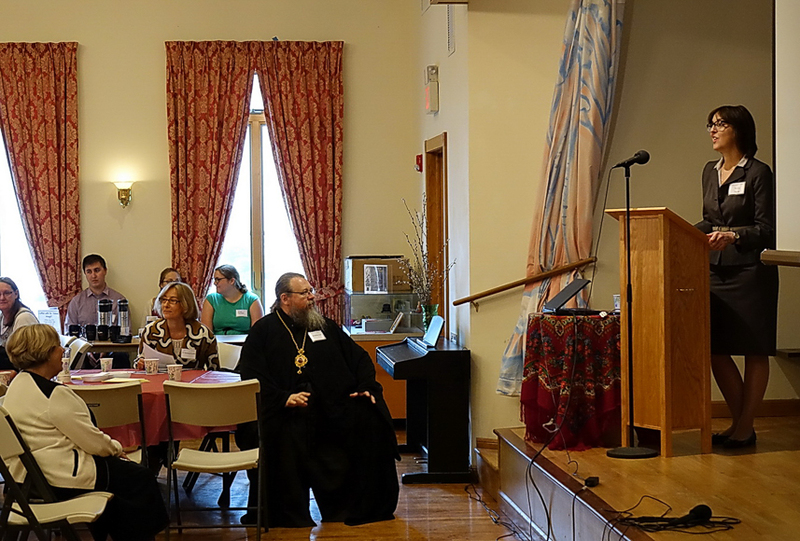 WOMEN’S CONFERENCE "LIVING AND THINKING ORTHODOXY, YESTERDAY AND TODAY"
Thanks to the support of our generous donors, on Saturday, June 27, an Orthodox Women’s Conference entitled "Living and Thinking Orthodoxy, Yesterday and Today," was held in Glen Cove, NY. The conference offered deep knowledge of the world of Orthodoxy today and collected many matushkas, as well as many young women. The conference was organized by Holy Virgin Intercession & St. Sergius Parish in Glen Cove. 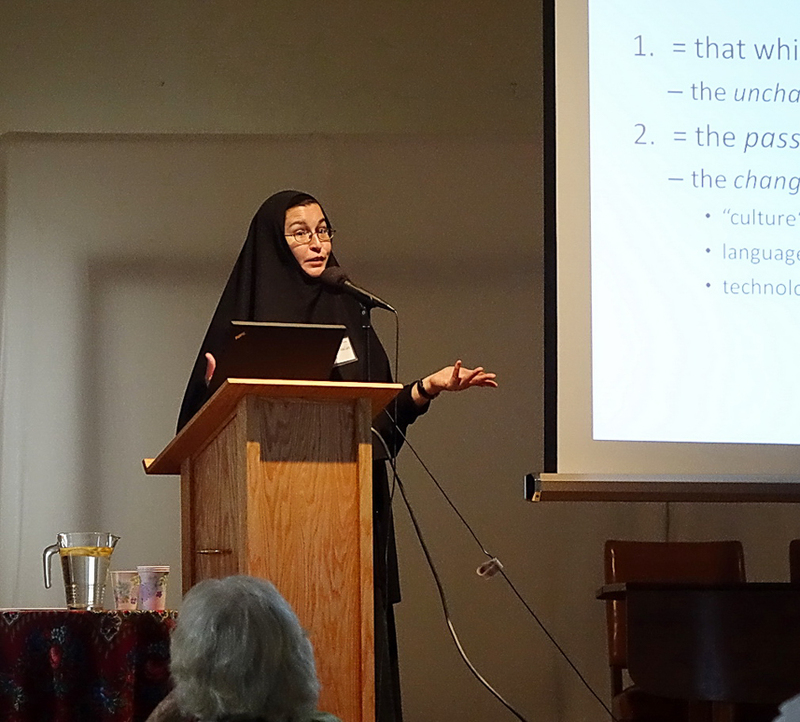 The conference’s main speakers were Metropolitan Jonah (Paffhausen; former Primate of the Orthodox Church in America), Dr. Valerie A. Karras (adjunct lecturer at Eden Theological Seminary in St. Louis, MO), and Dr. Sister Vassa (Larin; research fellow at the University of Vienna). Moderating the conference was Dr. Nadieszda Kizenko (associate professor at SUNY Albany). More than 60 people participated in the conference. 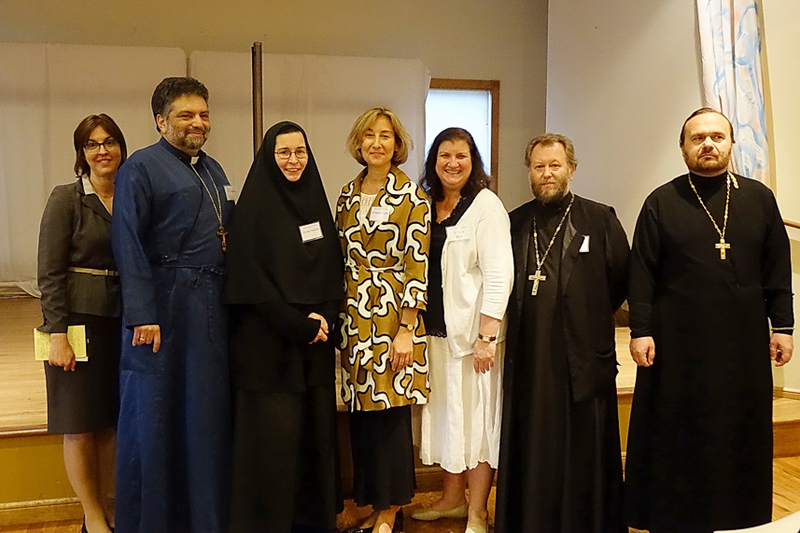 Despite the fact that the conference was originally prepared for a female audience, it eventually grew church-wide, as interest in participating was expressed not only by women, but also by clergy of the Russian Church Abroad and the Greek Archdiocese. The conference thus ceased to be solely a Russian event, but rather demonstrated again that Orthodox Christians in America share not only feasts and joys, but problems and questions, as well. The primary themes touched upon at the conference included the religious upbringing of children in the family, including liturgical life in the early centuries of the Church, and the nature of tradition and how it affected and affects church life in our day and age. Metropolitan Jonah, spoke about the need to talk about Orthodoxy with our young people; how to make it so that our youth remember God with every step; how what our children learn in school is to be harmonized with Church teaching. His Eminence especially spoke about the uselessness of teaching children and young people anything that their own parents did not follow in their daily lives. How can young men and women create a family (and what kind of family? ), if so many children are raised in broken homes and do not have before them an example of a well-structured and religious family? How should parents react when public schools indoctrinate their students with lessons inimical to Orthodox teaching? These are just some of the questions facing parents and the Church in the matter of bringing up the next generation, and meetings like this offer an opportunity to discuss them and provide answers. Dr. Valerie Karras (Greek Archdiocese) delivered a very interesting lecture on "The Liturgical Roles of Women in the Early and Byzantine Church." A specialist in Byzantine music with a doctorate in Theology, Valerie Karras teaches New Testament at Eden Theological Seminary. Among her interests are Church history, women in early and Byzantine Christianity, and the participation of Christians in interfaith and female dialogue. Her knowledge of parish life is not superficial, either: her practical experience in parish life includes many years of activity as a choir director and chanter in several widely varying parishes. Illustrating her presentation with slides, including frescoes from Hagia Sophia in Turkey depicting women carrying out various obediences in the Church, Dr. Karras demonstrated the active role played by women in the early and Byzantine Church. This included not only deaconesses (perhaps the only female role known to most of us). Also playing their part – taking into account here their age and social status – were widows, virgins, nuns, myrrh-bearers, and women preachers… In the early and Byzantine Church, we find answers to many of the questions that interest not only neophytes, but also those who have been in the Church for years: Why do women and men stand on opposite sides of the church? Why are female saints depicted on the left side of the church, while male saints are on the right? Did Byzantine Greek women cover their heads, in contrast to some of our contemporaries today? Where did the emperors and empresses commune..? Nun Vassa (Larin) was one of the presenters. Nun Vassa (Larin) grew up in a church family, with her entire household serving in the temple: her father, Archpriest George Larin, served for decades as rector of Holy Virgin Protection Church in Nyack, NY, while her mother, Matushka Ekaterina Larin, was busy with a multitude of obediences in the church and the parish school. Sister Vassa fulfilled obediences in the convents of Europe and the Holy Land, but found her calling in the field of education, at the University of Vienna; she is renowned for her many presentations before audiences from various jurisdictions and countries, but for the younger generation, she is familiar thanks to her YouTube program, "Coffee with Sr. Vassa," aimed at those living in the big city and yet wishing to live life according to the church calendar. Dr. Nun Vassa (Larin) delivered a lecture on the topic "Does Tradition Change?" In effect, she brought the topics of the previous speakers full circle: What is Tradition, and have Church traditions changed over time and in various countries? "Sister Vassa’s lecture was interesting in that it explained that Tradition exists and is truly something of the Church," explained Archpriest Serafim Gan, chancellor of the Synod of Bishops and rector of St. Seraphim Memorial Church in Sea Cliff, NY. "We can make use of these thoughts when discussing various questions and seeing truth. This is a good line of thought to follow when questions arise relating to the calendar and the canons. The Church is a living organism, and we need a discussion that focuses on the history and traditions of our Church. Such a discussion will help offer more depth to Church life, enlighten the people of the Church, and add to the knowledge necessary to recognize the processes taking place in our Church." "In order to avoid confusion, our faithful must know history," opined Archpriest Alexandre Antchoutine, Diocesan Council member and rector of Holy Virgin Intercession Church in Glen Cove. "What roles played by women can be restored in the church in our time, and which should be learned only for the sake of being familiar with history?" Fr. Alexandre is certain that there are no bad questions; even those that engender discussion should be voiced openly and resolved, utilizing history and tradition: "We spend too much time adorning our churches, demonstrating outward piety, and in general attending to the ritual side of things – where should I stand in church, which scarf should I wear, which priest should I go to? – instead of talking about the personal relationships of the faithful with God and helping to foster those relationships." Fr. Alexandre voiced his satisfaction with the fact that the conferences, which several years ago began as a Russian event, have advanced to an inter-Orthodox level, and expressed his hope that, with each year, more of the faithful will take part in them. This is especially important for Russian Orthodox Christians who come to a country with 15 Orthodox jurisdictions, and cannot always decipher the multitude and variety of local traditions. The lectures and discussions held at the conference once more demonstrated the necessity for modern believers to use appropriate forums to become better acquainted the academic fundamentals of theology and improve their knowledge of the Orthodox Faith; they also showed the importance of overcoming a closed mind toward the past and future, understanding that not everything we call a novelty is always entirely negative, and often has its roots in the early Church. Without a doubt, it is important to preserve what we have been given by our ancestors. But we should not forget that history is not only preserved, but also made. And we, the people of the Church, must understand this and accept it with all our hearts. Among the undertones voiced at the conference was the thought that Orthodoxy is not a religion of minor prohibitions, not something that can be called adherence to "a thousand taboos," but a religion of love. It is no coincidence that, while we see prohibitions indicated throughout the Old Testament, in the New Testament we are brought the commandments of love and indication as to how we ought to live our lives: "…by this shall all men know that ye are my disciples, if ye have love one to another" (John 13:35). Both clergy and lay participants in the conference voiced a shared line of thinking regarding the importance of the person of the priest in the life of the believer: not as a minor custodian, but as a guide to God, who can show someone that he or she is unique in this life and precious as a person before God, and is loved by God. He can help the believer to form a personal relationship with God and wisely determine the moderate – "royal" – path on the road to salvation, along which the Orthodox Christian can be saved throughout the course of his life – regardless where in the world he happens to be – fulfilling God’s commandments and participating in the life of the Church, by his talents and abilities bringing light and love to those around him. Fr. Alexandre thanked all those who worked to organize and run the conference: Natalia Fekula, Katherine Kallaur, Ivan and Maria Drevinsky, young parishioners of Holy Intercession Church in Glen Cove and St. Seraphim Church in Sea Cliff; and sincerely thanked the Fund for Assistance to ROCOR for their financial support. He expressed his hope that the tradition of annual conferences at Holy Intercession Church will continue, and that the now-inter-Orthodox conferences will become a regular part of helping the faithful to deepen their knowledge of Orthodox history, and broaden the views of the processes taking place in our parishes and our Church as a whole.